In a surprise turn of events at today's iPad mini announcement, Apple also refreshed the 9.7-inch iPad, replacing the third generation "new iPad" with what I can only half-jokingly refer to as the "new-new iPad", but in actuality, is now referred to as "iPad with Retina display." Apple today also announced the fourth generation iPad featuring a gorgeous 9.7-inch Retina™ display, new Apple-designed A6X chip, FaceTime HD camera and ultrafast wireless performance. Both iPad mini and fourth generation iPad come with iOS 6, the world’s most advanced mobile operating system with over 200 new features. The new fourth generation iPad features the amazing 9.7-inch Retina display and includes a new Apple-designed A6X chip that delivers up to twice the CPU performance and up to twice the graphics performance of the A5X chip, all while delivering an incredible 10 hours of battery life in the same thin and light iPad design. Other new features include a FaceTime HD camera, twice the Wi-Fi performance when compared to previous iPad models and support for additional LTE carriers worldwide. So basically, the new iPad 4, as I'll call it, replaces the 6-month old iPad 3, and bumps the processor and graphics capabilities of the iPad. The iPad 4 also includes support for Apple's new charging and accessory port, Lightning, and replaces the old 30-pin connector that has been used on iDevices for the last 10 years. The fourth generation iPad with Wi-Fi models will also be available on Friday, November 2, in black or white for a suggested retail price of $499 (US) for the 16GB model, $599 (US) for the 32GB model and $699 (US) for the 64GB model. 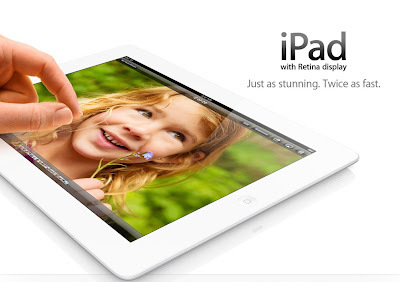 For more information about the new iPad 4, visit the Apple iPad website.